SOUTH BEND – Beacon Health System Chief Executive Officer Phil Newbold today announced he is stepping down from his current position on Nov. 1. The Board of Directors appointed Beacon’s Chief Operating Officer, Kreg Gruber, to take his place. Newbold has served as CEO for 30 years and will remain at Beacon until the end of the year to provide transitional support. Newbold is recognized as one of the most innovative health care leaders in the country, while remaining committed to health initiatives in the local communities served by Beacon. The health system was created under his leadership through the affiliation of Memorial Hospital and Elkhart General Hospital in 2011. Beacon established one of the first hospital tithing policies in the country. Beacon became the first Indiana hospital to join the Mayo Clinic Care Network, allowing local physicians to collaborate with Mayo specialists. Beacon Children’s Hospital completed a $50 million expansion in downtown South Bend, incorporating an advanced single-family room NICU model that is new to the U.S., encouraging parents to bond with their premature babies. More than 1,000 business and community leaders have taken innovation and leadership development courses at the Pfeil Innovation Center. Memorial HealthWorks! Kids’ Museum opened a health education center in South Bend with the model replicated in St. Louis and Tupelo, Miss. Beacon purchased Madison Center and renamed it Memorial Epworth, to ensure the continuation of inpatient psychiatric services in the region. Beacon Health & Fitness opened medically based, full-service fitness centers in South Bend and Granger and began construction on an Elkhart location, which included an innovative public-private partnership that will also bring a state-of-the-art aquatics center to the community. Elkhart General Hospital completed an $83 million surgery center expansion. Memorial introduced the first and only MedFlight service in the region, and became the region’s only designated Level II Trauma Center. Beacon became the only health system in Indiana to offer the Ornish Lifestyle Medicine™ Program for reversing heart disease. 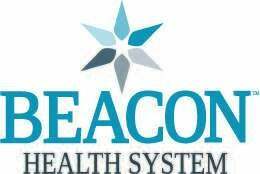 The board anticipates a smooth transition, he said, because Beacon has long been committed to a strong leadership development culture across the health system. As preparation for his role as CEO, Gruber has served as President of Memorial Hospital, President of Elkhart General Hospital, President of Beacon Medical Group, and most recently as Chief Operating Officer of Beacon Health System. He moved to the South Bend area and joined Memorial Hospital in 2006. To schedule an interview, contact Heidi Prescott, Media Relations Specialist, Beacon Health System, at 574.303.7947 or gro.metsyshtlaehnocaeb@ttocserph.